What kid doesn't like chocolate milk? 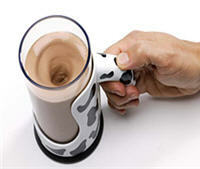 With the new Moo Mixer Supreme, mixing up chocolate milk, Kool Aid, tea, and other liquid is a breeze. NEW styling for a proven winner! The NEW 16 oz. Moo Mixer Supreme features an easy to use trigger button, fun to hold handle and large detachable clear tumbler. Battery operated (two AAs, not included), dishwasher safe clear tumbler and the totally cool mixing action that makes a whirling vortex of power to thoroughly dissolve chocolate powder mixes or syrups! For an out of this world experience. The New Moo Mixer Supreme. Sorry no milk or cows included with the Moo Mixer.